Le High Lonesome Lodge est lodge de luxe dans la région Hochatown. Emmenez toute la famille pour une escapade de détente à la High Lonesome. Le High Lonesome Lodge est nichée dans un bosquet de pins; il dispose d'planchers de bois franc, plafonds voûtés, et une grande cheminée en pierre. Il est joliment décoré avec des meubles de cèdre rouge de l'Ouest et des accents occidentaux. Avec 3 chambres et 3 salles de bains, il est très accommodant à une retraite de couples ou une famille nombreuse. Il ya quelque chose pour tout le monde à la High Lonesome. Cuire un repas gastronomique dans la cuisine spacieuse ou de sortir sur le pont et grill quelques steaks après une longue journée de visites touristiques, la randonnée, le vélo ou la pêche. Profitez d'un film, câliner en face de la cheminée dans le salon, ou profiter d'une partie de billard dans le loft. Les enfants vont adorer nourrir le poisson-chat dans l'étang approvisionné. À la fin de la journée, se détendre et observer les étoiles dans le bain à remous de 8 personnes. Votre séjour à High Lonesome sera celui que vous ne serez pas prêt d'oublier! Situé dans Trails Kaniatobe, le High Lonesome Lodge est un 2300 sq. Ft., 3 chambres, 3 salles de bains, 2 étages cabine pouvant accueillir 11 invités. Il ya aussi un lit de matelas d'air de reine. We LOVED this cabin. 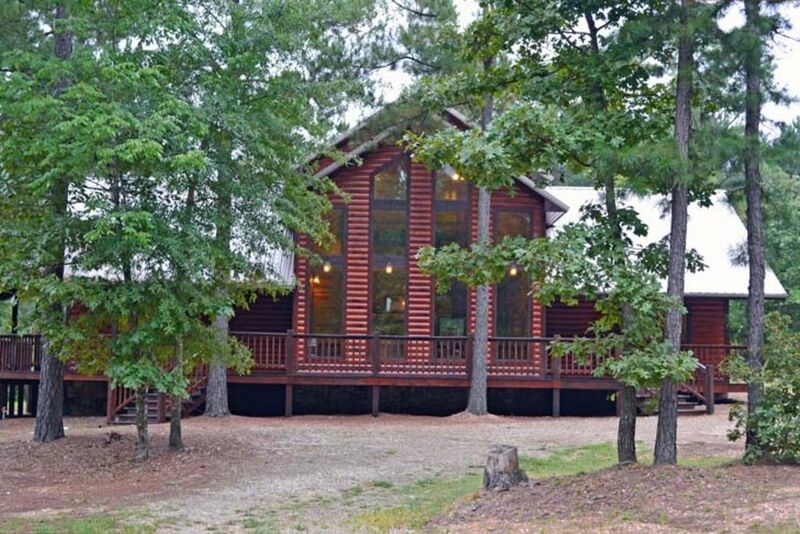 This was our third time staying in Broken Bow, and we absolutely cannot say enough good things about this house. The house has everything you need inside and out. It’s simply beautiful. Our kids had so much fun fishing in the pond! No one wanted to leave. I have nothing bad to say! It was great!!! We absolutely loved this cabin. It was the best place to spend time with family. No complaints at all! We had everything we needed. We will be back soon. We had everything we could have wanted/needed here. We have no complaints. Was a perfect set up. Thank you very much. All of us —- 4 adults, 4 kids —- had a terrific time. We loved the way the house was set away from all others. The house’s sign could face the approaching road a little better. It took us almost our whole stay to get accustomed to the correct turn. We saw the orange fish, but he wouldn’t bite. The spa cover fell down when our 3 year old and her father were in the hot tub. It hit her head and knocked her face into the tub edge. There probably should be someway to secure the cover when open. Everything was very clean and well stocked. We didn’t want for anything we couldn’t find. Thanks for a happy family getaway. Rates are based on 6adults each additional adult is $15/night No Pets allowed inside cabins. No smoking inside cabins. Failure to comply will result in a $500 charge to your credit card plus any damages to the cabin. 2 night minimum stay and 3 nights minimum stay on holidays, fall break and spring break. Check in: 4:00 pm or after. Check out: 11:00 am. Owners/management are not liable or responsible for damages/losses to guest property or person. A $50. non-refundable deposit is required when reservation is made. This deposit will be applied to your reservation balance. The remaining balance is due 14 days prior to your arrival. If you are making reservations within 14 days of arrival date, balance will be charged when reservation is confirmed. Cancellations and date changes made WITHIN 14 days of arrival will be charged the full reservation fee if we are unable to rent the cabin. Cancellations or date changes must be confirmed by the manager. You will receive a confirmation email stating the change or cancellation. We are not able to give refunds due to bad weather and/or early departure. If you are concerned about extreme weather conditions, loss of job or illness consider purchasing trip insurance. Missing items/damages will be charged to guest account. Please treat the cabin as if it were your own. Spring break parties, bachelor parties and other parties of the same nature are not allowed in cabin. Partying at the cabin will result in eviction without a refund. Print your reservation confirmation receipt and driving directions; these will be required to find your cabin.